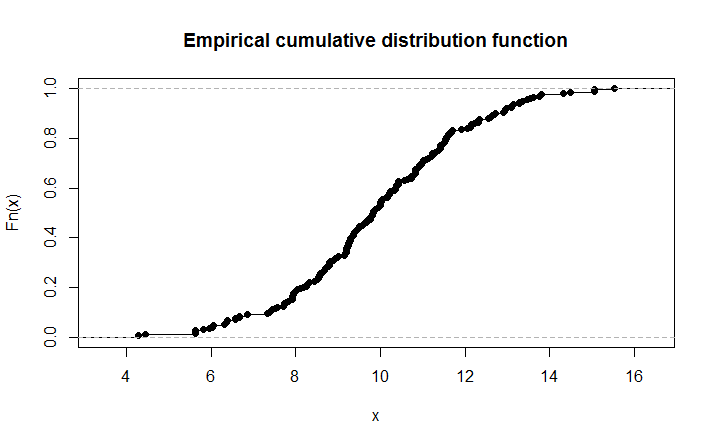 Fitting distributions consists of finding a mathematical function which represents a statistical variable. Data scientists and statisticians are often faced with this problem: they have some observations of a quantitative character x1, x2, …, xn and they wish to test if those observations, being a sample of an unknown population, belonging to a population with a pdf (probability density function) f(x,θ), where θ is a vector of parameters to estimate with available data. This article aims to face fitting distributions dealing shortly with theoretical issues and practical ones using the statistical environment and language R.
R is a language and an environment for statistical computing and graphics flexible and powerful. We are going to use some R statements concerning graphical techniques, model/function choice, parameters estimate, measures of goodness-of-fit and most common goodness-of-fit tests. To understand this work a basic knowledge of R is needed. We suggest a reading of “An introduction to R”. R statements, if not specified, are included in stats package. Exploratory data analysis can be the first step, getting descriptive statistics (mean, standard deviation, skewness, kurtosis, etc.) and using graphical techniques (histograms, density estimate, ECDF) which can suggest the kind of pdf to use to fit the model. We can obtain samples from some pdf (such as Gaussian, Poisson, Weibull, gamma, etc.) using R statements and after we draw a histogram of these data. 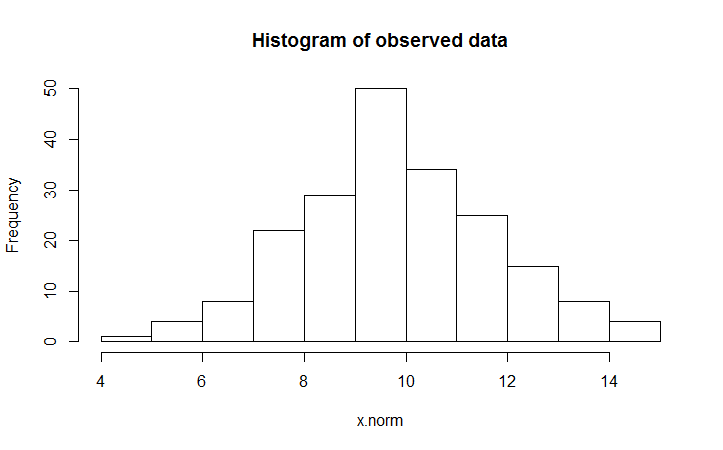 Histograms can provide insights on skewness, behavior in the tails, presence of multi-modal behavior, and data outliers; histograms can be compared to the fundamental shapes associated with standard analytic distributions. 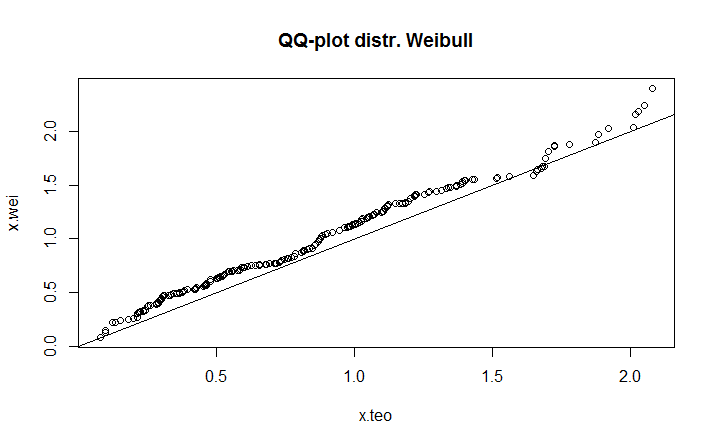 A Quantile-Quantile (Q-Q) plot3 is a scatterplot comparing the fitted and empirical distributions in terms of the dimensional values of the variable (i.e., empirical quantiles). It is a graphical technique for determining if a data set come from a known population. In this plot on the -axis we have empirical quantiles e on the x- axis we have the ones got by the theoretical model. A 45-degree reference line is also plotted. If the empirical data come from the population with the chosen distribution, the points should fall approximately along this reference line. The greater the departure from this reference line, the greater the evidence for the conclusion that the data set have come from a population with a different distribution. where x.wei is the vector of empirical data, while x.teo are quantiles from theoretical model. The first step in fitting distributions consists in choosing the mathematical model or function to represent data in the better way. 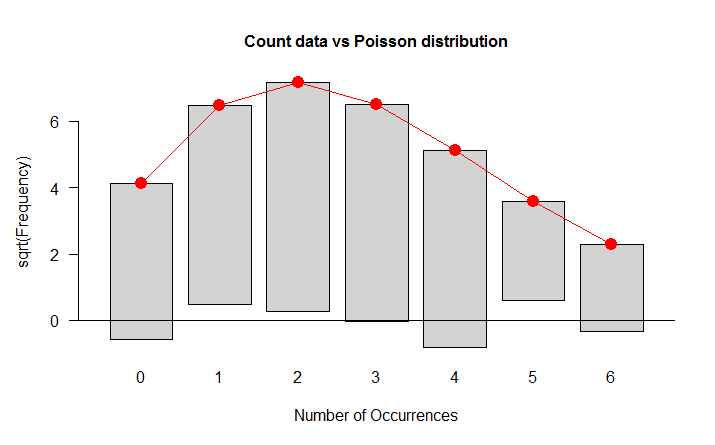 Sometimes the type of model or function can be argued by some hypothesis concerning the nature of data, often histograms and other graphical techniques can help in this step, but graphics could be quite subjective, so there are methods based on analytical expressions such as the Pearson’s K criterion. Solving a particular differential equation we can obtain several families of function able to represent quite all empirical distributions. Those curves depend only by mean, variability, skewness and kurtosis. Standardizing data, the type of curve depends only by skewness and kurtosis measures. For a mathematical treatment, see Strickland, J. (2015). Operations Research using Open-Source Tools. Lulu.com. ISBN 978-1-329-00404-7. According to the value of K, obtained by available data, we have a particular kind of function. Here are some examples of continuous and discrete distributions, they will be used afterwards in this paper. 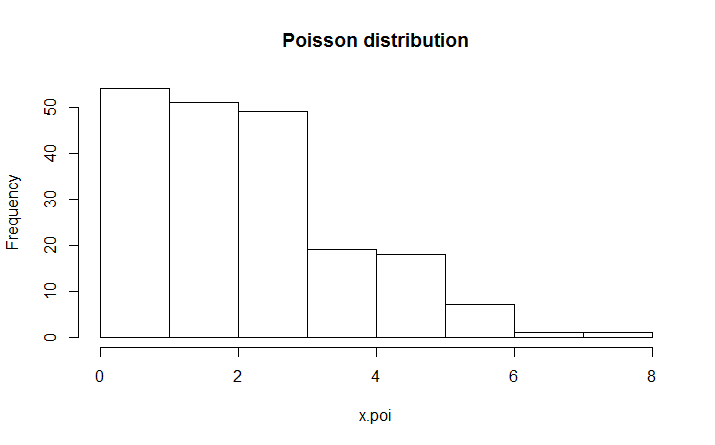 For each distribution there is the graphic shape and R statements to get graphics. 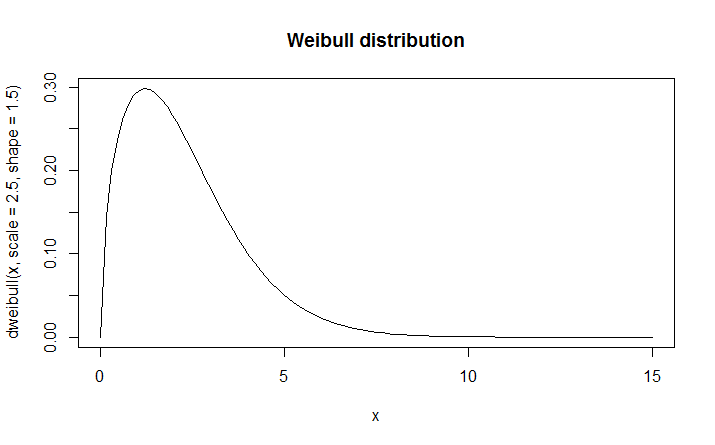 Suppose we have a Weibull distribution with scale parameter 2.5 and shape parameter 1.5 (Figure 9). 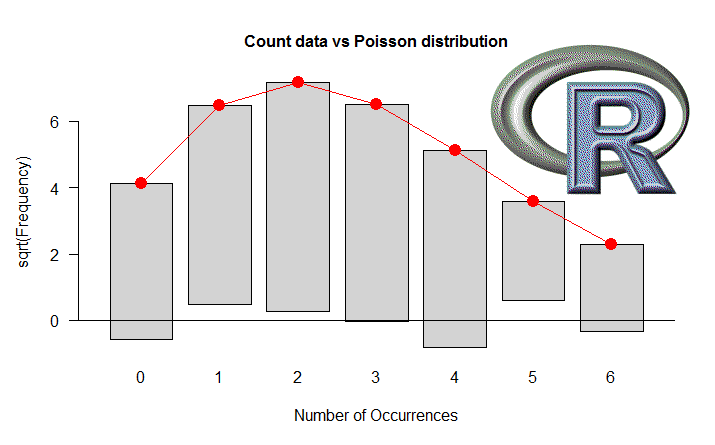 The method of moments is a technique for constructing estimators of the parameters that is based on matching the sample moments with the corresponding distribution moments. This method equates sample moments to population (theoretical) ones. When moment methods are available, they have the advantage of simplicity. To see how to define sample (empirical) moments in this way, please refer to see Strickland, J. (2015). Operations Research using Open-Source Tools. Lulu.com. ISBN 978-1-329-00404-7. Suppose we have a gamma distribution with rate parameter 0.5 and shape parameter 3.5. The method of maximum likelihood is used in statistical inference to estimate parameters. 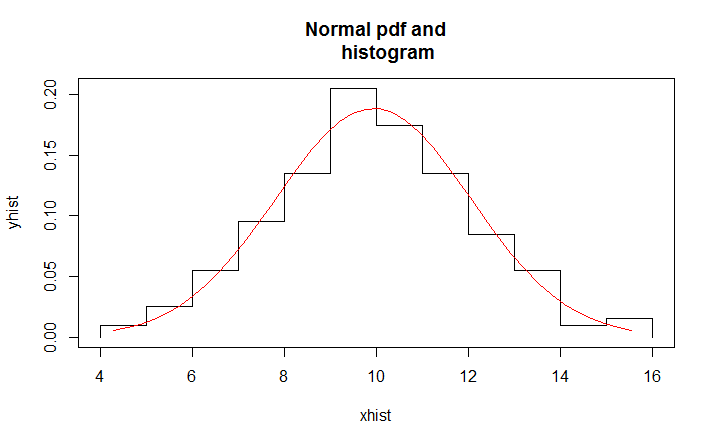 We have a random variable with a known pdf f(x,θ) describing a quantitative character in the population. We should estimate the vector of constant and unknown parameters θ according to sampling data: x1, x2, …, xn. Maximum likelihood estimation begins with the mathematical expression known as a likelihood function of the sample data. Loosely speaking, the likelihood of a set of data is the probability of obtaining that particular set of data given the chosen probability model. This expression contains the unknown parameters. Those values of the parameter that maximize the sample likelihood are known as the maximum likelihood estimates (MLE). MLE have several statistical properties and advantages. We supply as starting values of parameters estimates arbitrary ones, but, we could use estimates got by the methods of moments. The statement mle() allows to estimate parameters for every kind of pdf, it needs only to know the likelihood analytical expression to be optimized. In MASS package is available fitdistr() for maximum-likelihood fitting of univariate distributions without any information about likelihood analytical expression. It is enough to specify a data vector, the type of pdf (densfun) and eventually the list of starting values for iterative procedure (start). A goodness-of-fit measure is useful for matching empirical frequencies with fitted ones by a theoretical model. We have absolute and relative measures. The details are covered in see Strickland, J. (2015). Operations Research using Open-Source Tools. Lulu.com. ISBN 978-1-329-00404-7. These tests are sometimes called as omnibus tests and they are distribution free, meaning they do not depend according the pdf. We shall point out our attention to normality tests. The Chi-square test is the oldest goodness-of-fit test dating back to Karl Pearson (1900). 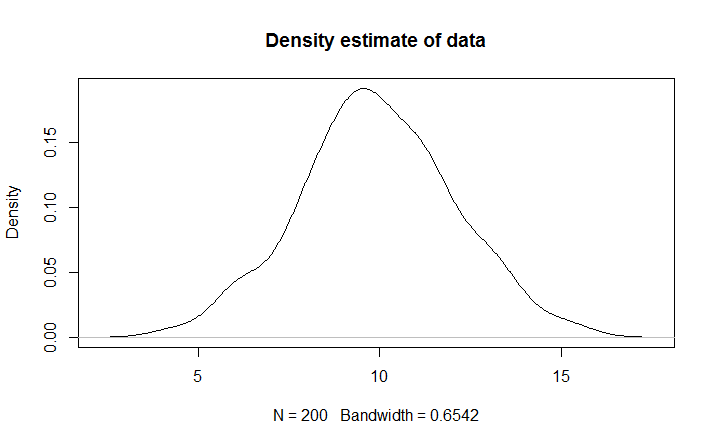 The test may be thought of as a formal comparison of a histogram with the fitted density. In R environment there are three ways to perform a Chi-square test. H0 is accepted as the p-value is grater than of a significance level fixed al least in 5%. We can’t reject null hypothesis as p-value is rather high, so probably sample data belong from a gamma distribution with shape parameter=3.5 and rate parameter=0.5. The Kolmogorov-Smirnov test is used to decide if a sample comes from a population with a specific distribution. It can be applied both for discrete (count) data and continuous binned (even if some Authors do not agree on this point) and both for continuous variables. 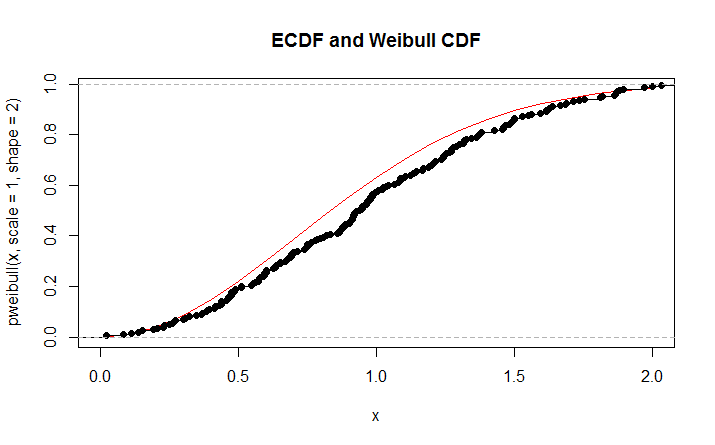 It is based on a comparison between the empirical distribution function (ECDF) and the theoretical one F(x) = ∫f(y,θ)dy, where f(y,θ) is the pdf. Kolmogorov-Smirnov test is more powerful than Chi-square test when sample size is not too great. For large size sample both the tests have the same power. The most serious limitation of Kolmogorov-Smirnov test is that the distribution must be fully specified, that is, location, scale, and shape parameters can’t be estimated from the data sample. Due to this limitation, many analysts prefer to use the Anderson-Darling goodness-of-fit test. However, the Anderson-Darling test is only available for a few specific distributions. Very often a statistician is called to test if data collected come or not from a normal population, we shall examine the main normality tests. 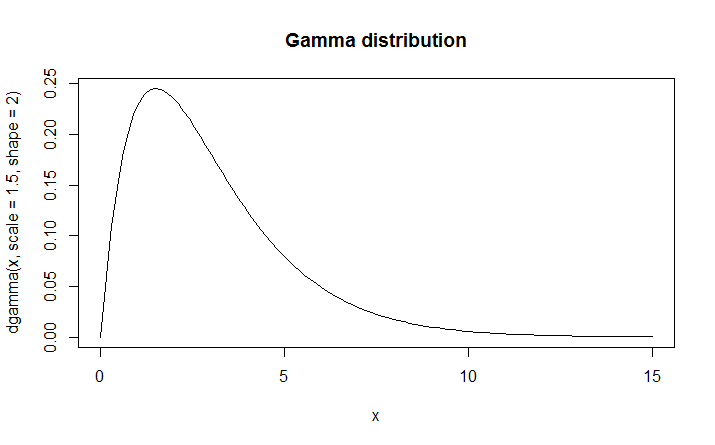 There are in statistical literature some tests useful for testing only skewness or only kurtosis (or both the two at the same time) of a distribution based on the well-known b3 e b4 (or gamma3 e gamma4). Shapiro-Wilk test is one of the most powerful normality tests, especially for small samples. Normality is tested by matching two alternative variance estimates: a non-parametric estimator got by a linear combination of ordered sample values and the usual parametric estimator. The weights () are available in a statistical table. The -value is higher than significance levels usually used to test statistical hypotheses, we accept null hypothesis that is sample data belong form a gaussian distribution. 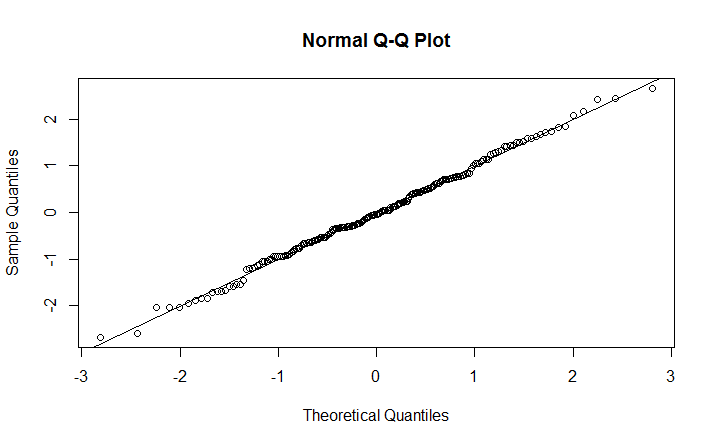 Jarque-Bera test is used a lot to test normalità in Econometric. It is based on skewness and kurtosis measures of a distribution considering the asymptotic distribution of b3 e b4, which, under null hypothesis, is a chi-square with 2 degrees of freedom. A test proposed by Cucconi (an Italian statistician) allows to test normality without the problem of estimating parameters by sample data. It is a modification of Kolmogorov-Smirnov test and it makes use of the specific distribution in calculating critical values. Currently, tables of critical values are available for the normal, lognormal, exponential, Weibull, extreme value type I, and logistic distributions. Anderson-Darling test is based on this statistic, A2. It is a modification of Kolmogorov-Smirnov test which can’t be used normality when the mean and standard deviation of the hypothesized normal distribution are not known (i.e., they are estimated from the sample data), it is particularly useful in case of small samples. 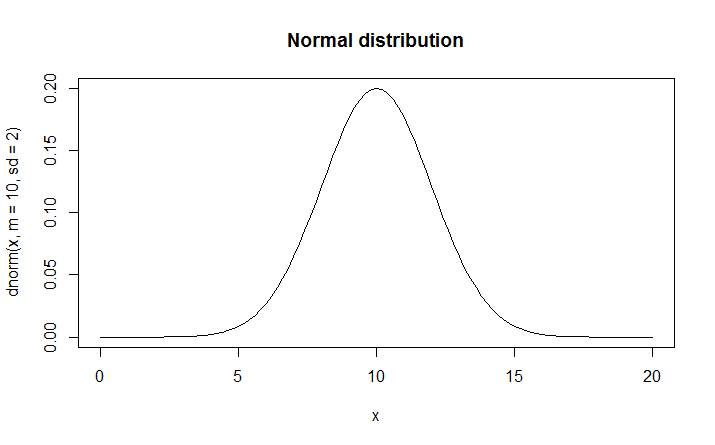 The Lilliefors test evaluates the hypothesis that X has a normal distribution with unspecified mean and variance, against the alternative that X does not have a normal distribution. This test compares the empirical distribution of X with a normal distribution having the same mean and variance as X. It is similar to the Kolmogorov-Smirnov test, but it adjusts for the fact that the parameters of the normal distribution are estimated from X rather than specified in advance. List of R statements useful in fitting distributions. The package including statement is written in parenthesis. Use showMethods(“summary”) for currently available ones. Error in chisq.test(x = f.os, p = p) : probabilities must sum to 1. Is the code below for the test proposed by Cucconi? Sometime the code gets “corrupted” when it is processed by WordPress for posting. I am working on the issue, but your corrections are probably right.